What Is So Wrong With The St. Luke's Campus? First of all, the City of Utica is already home to Oneida County's largest medical district. 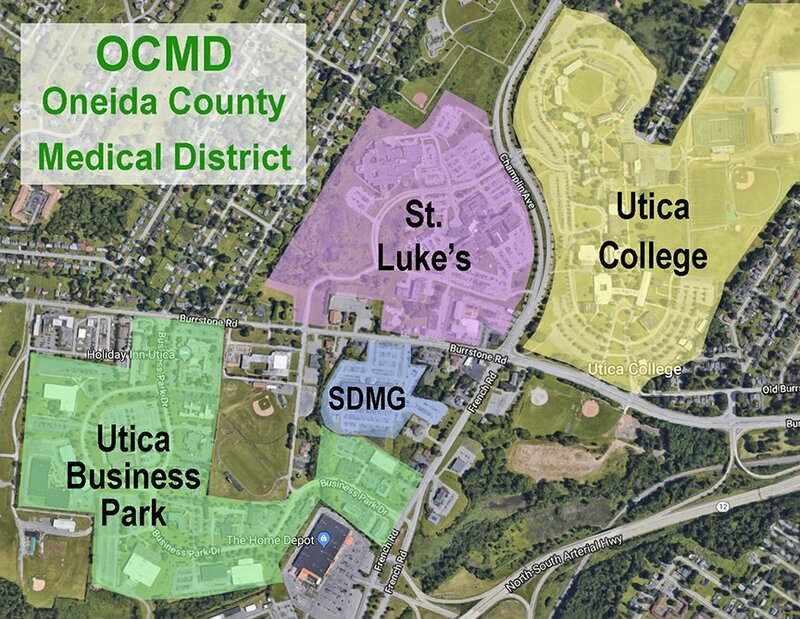 It's the area surrounding St Luke's Hospital, Utica College, and the Utica Business Park along with the substantial Slocum-Dickson Medical Group (SDMG) facility. Together, along with medical facilities on the French and Burrstone Road corridors, they make-up the Oneida County Medical District, or "OCMD". Scroll down, read our list of nearly 20 additional reasons for making St. Luke's the home of our new hospital! They claim there's a wetlands, but hospitals and many facilities displace wetlands all the time. Or they'll say, "It's hard to build new and run the current one at the same time" . 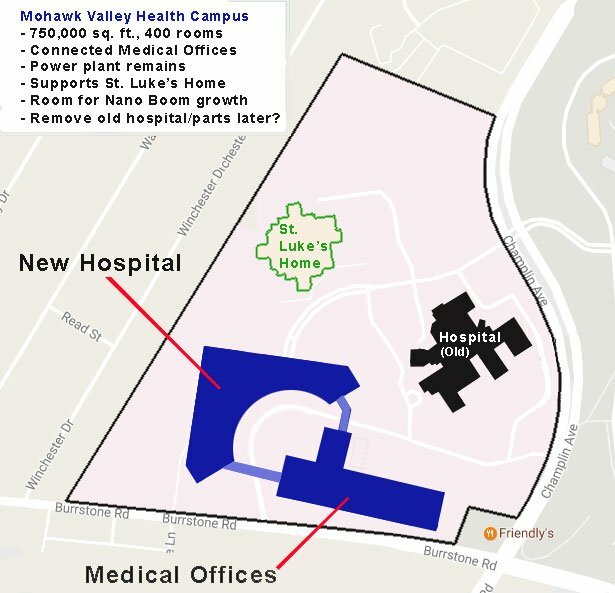 This is very surmountable as well; first, and as proof the MVHS's Board of Directors unanimously voted for the St. Luke’s campus at the same time they voted on downtown, and second, consider "hospital demolition/construction occurred less than 50 ft from existing operating room... surgeons never missed a operation." While the hospital administration has stated, "Our elected officials say the money can only be used for the downtown site", this is not true. Per Senator Griffo who states, "locate the hospital wherever it makes the most sense". If it was otherwise, why are politicians steering our hospital's and the region's healthcare investments? Furthermore, why did the hospital look for suitable sights ten mile outside of Utica? There are so many conflicting statements and questions. So we ask, what's so wrong with St. Luke's? Well, it seems the easiest question is, "What's so great about St. Luke's?" 1. The St. Luke's Campus offers a large, 64-acre, site. It's clear that historic Downtown Utica would be obliterated by a senseless, an inner-city, hospital district. 2. The Mohawk Valley Health System owns no land in downtown Utica, yet owns all 64-acres at St. Luke's. A former hospital board member told #NoHospitalDowntown, "Why are they looking at downtown? St. Luke's has been acquiring land for many years for this exact purposes, future expansion." 3. Utica College has many shared programs with St. Luke's hospital - and St. Luke's nursing home. Close to St. Luke’s are; (1) Slocum-Dickson Medical Group PLLC, (2) Bariatric Center of Excellence (Burrstone Rd), (3) Pulmonary & Sleep Medicine (Champlin Ave), (4) Kidney & Hypertension Consultants (Champlin Ave), (5) Lincare (Champlin Ave), (6) Medical Arts Ob-Gyn (Old Burrstone Rd), (7) Mohawk Valley Nephrology Associates (French Rd), (8) Mohawk Valley Practitioners (1 Notre Dame Lane), (9) Healthcare Monitoring Systems (French Rd), (10) OMNI Surgery Center (French Rd), and (11) AR Physical Therapy (French Rd). Inside the Utica Business Park opposite St. Luke's are; (12) Cooperative Magnetic Imaging (CMI), (13) Digestive Disease Medicine of CNY, (14) Mohawk Valley Endoscopy Center, (15) FootDoctors NY, (16) St. Elizabeth Lab at Utica Business Park, (17) ADHD & Autism Psychological Services & Advocacy, (18) Francis Eye & Laser Center, (19) Southern Tier Dermatology & Aesthetics, and (20) William A. Graber, MD, PC. If St. Luke's hospital closes/departs, the energy costs to the St. Luke's Nursing Home and Utica College escalate significantly, $800,000 annually! This as the three institutions at St. Luke's share a modern micro-grid, super efficient co-generation power plant. 5. St. Luke's sits on a green hilltop! Count the ways in which this fact is better than the proposed downtown location: (a) Clean air, (b) Nice views from hospital room windows, better site for much more pleasant walking trails, (c) Less congested roads, (d) Less noise, and (e) Easy helicopter landing/safer flight paths. Saying that St. Luke's Hospital is too old, at 60 years old, is not a fully accurate statement. Only about 25% of the original hospital is 60-years old, leaving 75% much newer and parts are even very modern! The more money spent on trying to evict businesses and destroying downtown, is the less funding can be placed into healthcare. "The BJH (Barnes-Jewish Hospital) campus is an urban one located near downtown St. Louis hot spots. City streets pass through the campus, making it a busy location. Like any inner-city institution, BJH is vulnerable to crime. That comes with the territory, but employees were shocked." Don't abandon St. Luke's and St. Elizabeth's, because the area does not have a very good track record. Consider abandon sites that are still vacant and or under utilized; Old Main (100 acres), Charlestown Mall (18.5 acres), Bendix/TRW on Seward Avenue (12.3 acres), Bossert Manufacturing, Harbor Point, Leland Area, GE Plant on Broad Street (23 acres), downtown ConMed building (1.1 acres), Old GE plant at Culver & Bleecker Streets (10.5 acres), Washington Courts (5.5 acres), Mele Manufacturing on Erie Street (6.3 acres), Dunlap on Oriskany Blvd (3.78 acres) and a few old schools. 14. No need to relocate 40+ downtown businesses, nor use eminent domain to take property owners private land. 15. You can build-on, or construct a new hospital onto a operational hospital and or site! Checkout a time lapse video, hospital "bridge" being built https://t.co/OLfhSNx5Zd pic.twitter.com/SOGoNoWIUI Expansions! Yes we can Utica!! 16. The St. Luke's Campus appears to be more central to Utica-area population masses. The populations of South Utica, New Hartford, Clinton, Whitesboro, and Clark Mills makes the St. Luke's Campus more central to more people. 17. Maybe you'd rather hear from an esteemed Utica doctor? Okay, read this letter, Dr. Christopher Max Say That St. Luke's Is Better (PDF). Dr. Max offers seven reasons why and also suggests that Faxton could be a good option as well. Use St. Luke's so there's more to downtown; a larger downtown to attract, make more interesting, more buildings that make for greater opportunity - more small businesses, creative spaces, old buildings, streets and alleys to explore. The creative class want good healthcare, but they also rank an interesting downtown as much more attractive, and important. On top of all this, Downtown Utica is already rebuilding on its own. With Nano technology finally starting to create jobs, Utica needs to plan and build for the elements that people want in a city, as more and more are attracted to urban living. Thus we remain #NoHospitalDowntown so we can protect a downtown that we love from being bulldozed.